Kilternan Adult Education is run by a voluntary committee who work to provide lifelong learning opportunities in a welcoming friendly environment. Over 30 courses are offered in Kilternan Adult Education Centre per term. 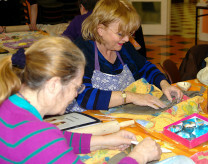 The Centre offers a combination of Morning and Evening courses, covering a broad range of areas, including: Art, Book Club, Computers, Creative Writing, Crochet, Enjoying English, Fit & Healthy for Life, Gardening, Genealogy, Golf, Guitar, History of Art, Music Appreciation, Nordic Walking, Photography, Photography and Picasa, Sewing Machine Class, Social Media, Yoga. SATURDAY: 10.00 a.m. – 12.00 p.m.
MONDAY: 9.30 a.m. – 11.30 a.m.
TUESDAY: 9.30 a.m. – 11.30 a.m.
WEDNESDAY: 9.30 a.m. – 11.30 a.m.
With Elma Murray. For those who want to build further on their knowledge of basic camera settings. Visit to Gallery of Photography and some specific field trips included. With Elma Murray. For those more familiar with camera settings who would like to develop further both technically and creatively. Specific areas of photography and related field trips included. Helen Morrow. Stress Management through yoga, stretching, breathing, relaxation and meditation techniques. With Noreen Curran. Advice on plants, shrubs, lawns and answers to your gardening queries. Includes two garden visits. Noreen Curran. This course is aimed to give an understanding of creating and maintaining a healthy garden. Includes two garden visits. With Tony Suttle. Deepen your enjoyment of art by looking at the work of some of the major artists who changed the way art is made. (There will be at least one gallery tour during the course). With Dex McGloughlin. An exercise class based on dance movements to popular tunes. Áine Miller. Discover that book or poem you always wanted to write. Máire MacConghail. Beginners class: enjoy learning how to research your family history - a practical hands-on course. With Olivia Hayes. Suitable for beginners. Audrey Cremin. Continue to build on existing skills and advanced techniques to make your own creations. Audrey Cremin. Learn to follow a pattern and create many interesting small items. Máire MacConghail. Continuation course : with a beginners course completed, this course brings you along the path to further explore family and local history. Olivia Hayes – Advanced Only. This course is for artists with experience in a wide range of watercolour techniques. Become familiar with all basic camera functions and learn to take more creative photos. Upload and edit photos on your computer. Some field trips included. With Stephen Matthews. A light hearted class in which we will ‘network’ with each other before reaching out to the wider world! With Trish McNally. T’ai Chi is a graceful series of set movements, a discipline for mind and body which can help alleviate many ailments. An exercise for health and wellbeing. Great for balance and flexibility. Suitable for people of all ages. With Katie Holland. Learn to use a sewing machine, cut and sew fabric accurately. Complete a small project e.g. bag, blanket, cushions. Beginners Welcome.